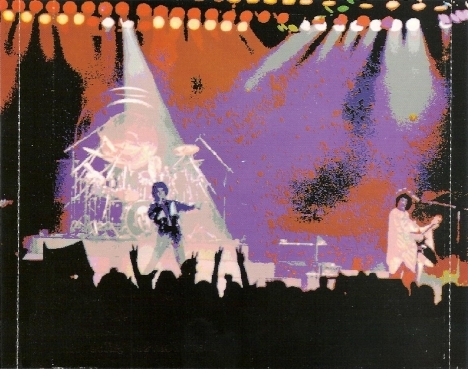 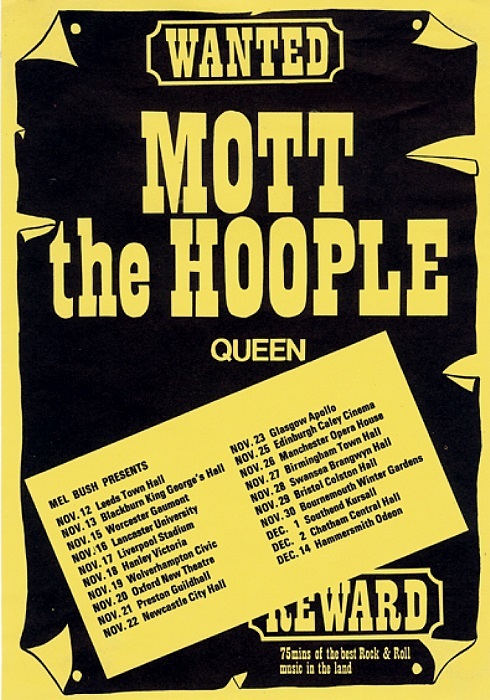 Rob Halford of Judas Priest was at this show (aged 22 at the time), and later recalled: "Queen were an incredible heavy metal band. 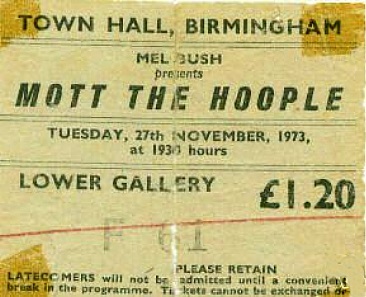 I saw them on their first ever tour, at Birmingham Town Hall. 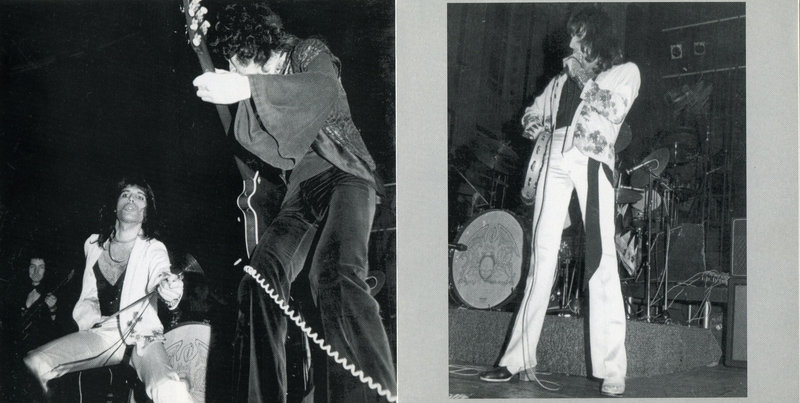 They just blew me away." According to a fan who saw the show, half the audience was at the bar at the beginning of Queen's set. 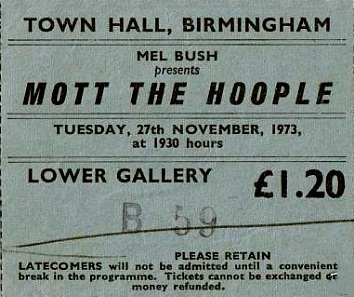 They were David Bowie fans who were there to see Mott The Hoople (Bowie wrote All The Young Dudes, their biggest hit). 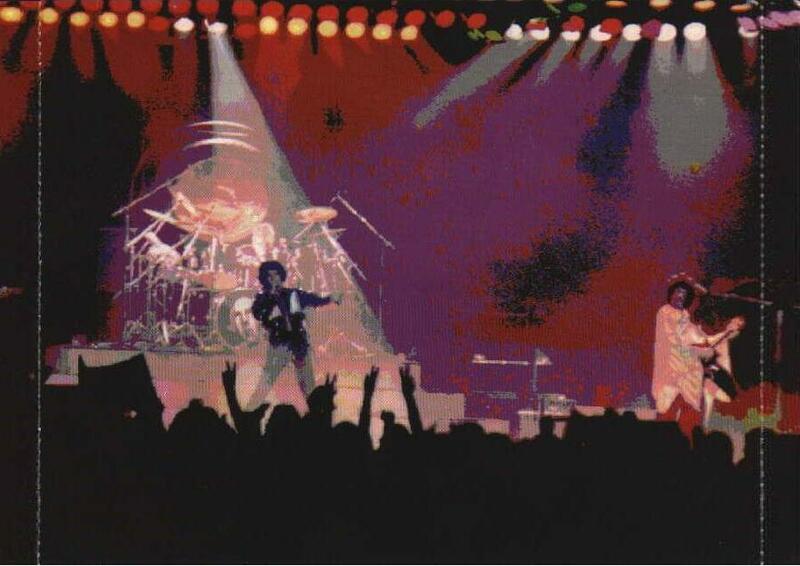 With each passing song, more people left the bar to watch Queen and were won over by the energetic show and the musicianship. 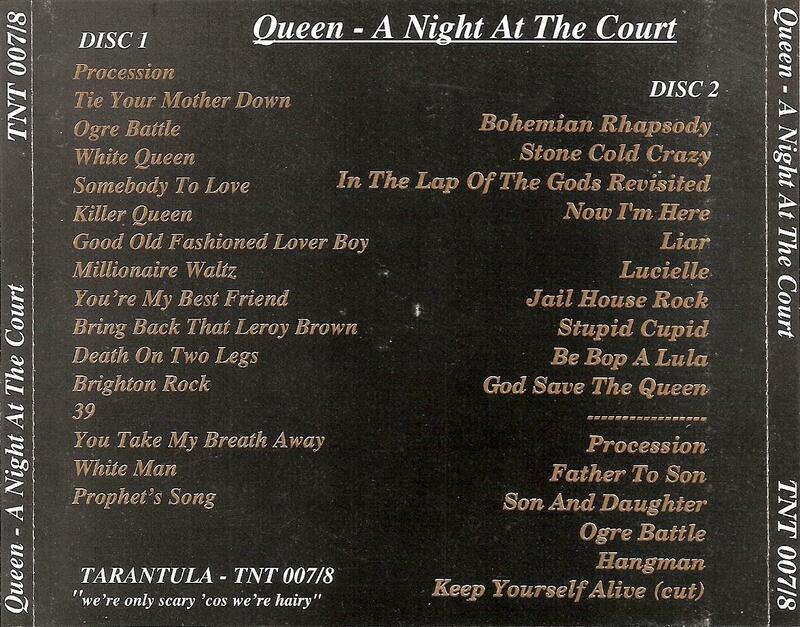 There's a funny moment during the a cappella second chorus of Hangman, after "Hang that rope from the highest tree". 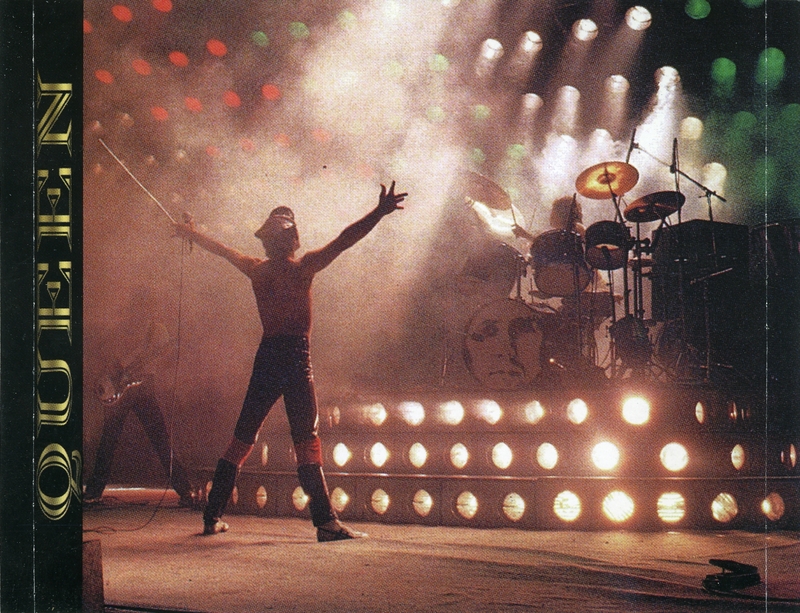 Freddie, in a campy voice, says, "Yes, you'll do that" (as he did last night in Keep Yourself Alive). 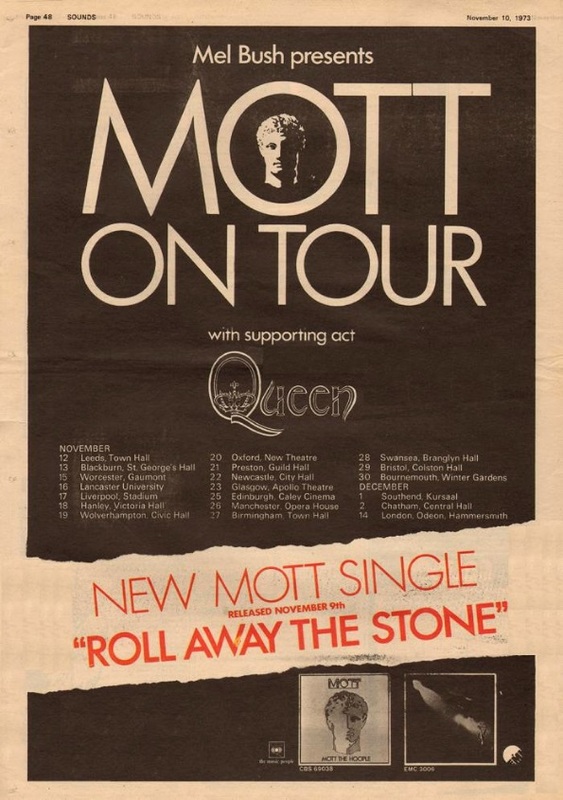 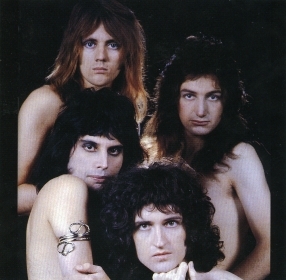 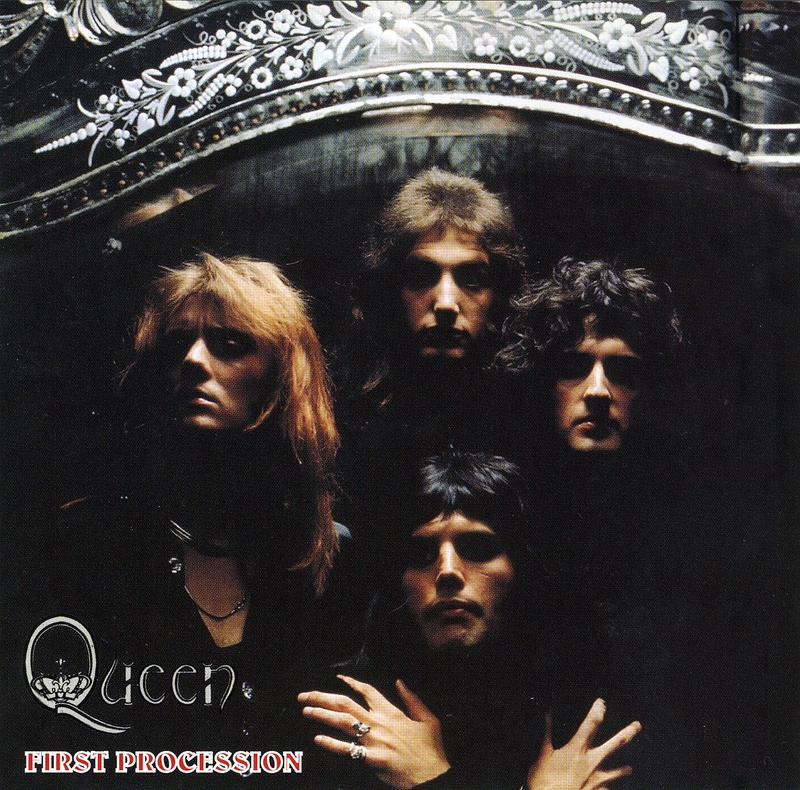 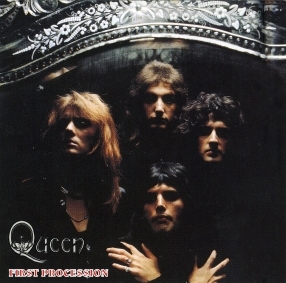 Queen's fortunes varied somewhat on this tour. 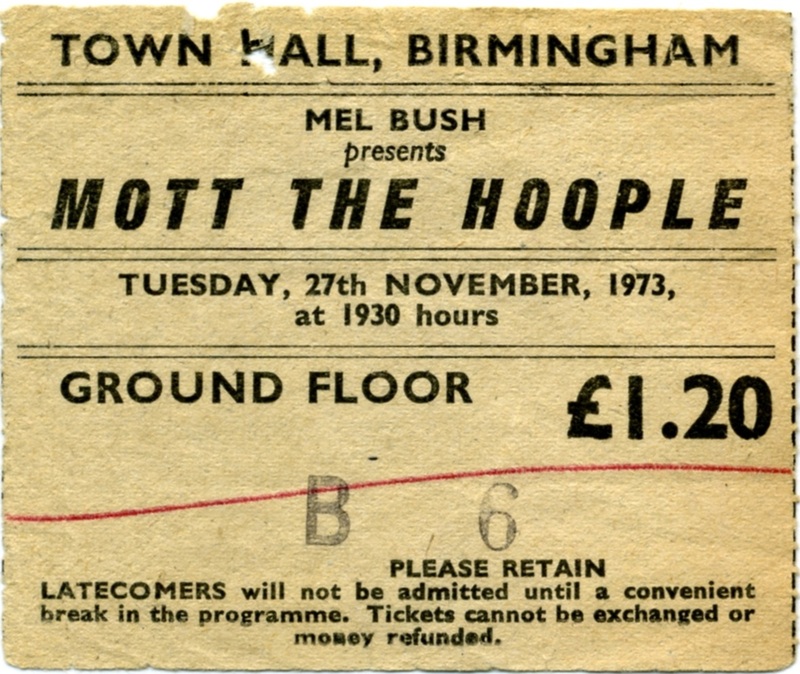 On many nights they were reported to have blown Mott The Hoople off the stage, but on this night things didn't go quite so smoothly. 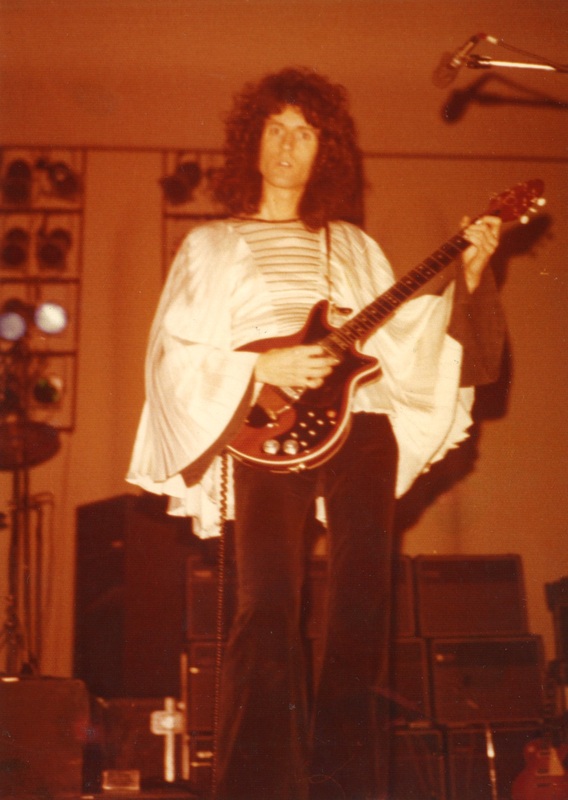 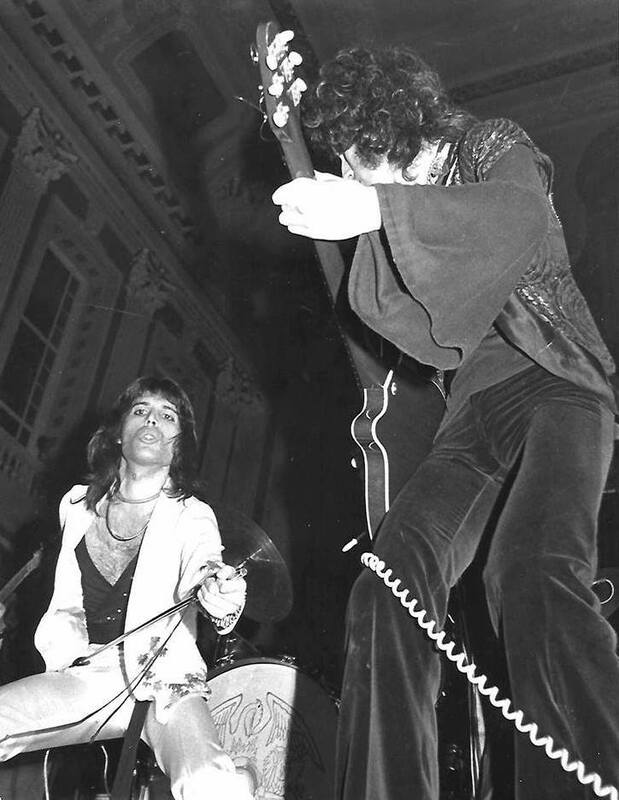 Someone who attended the show recalls a noticeably nervous Freddie Mercury, who even tripped over a monitor at one point: "Freddie was clearly winded, but continued on from the floor as if it were part of the show. 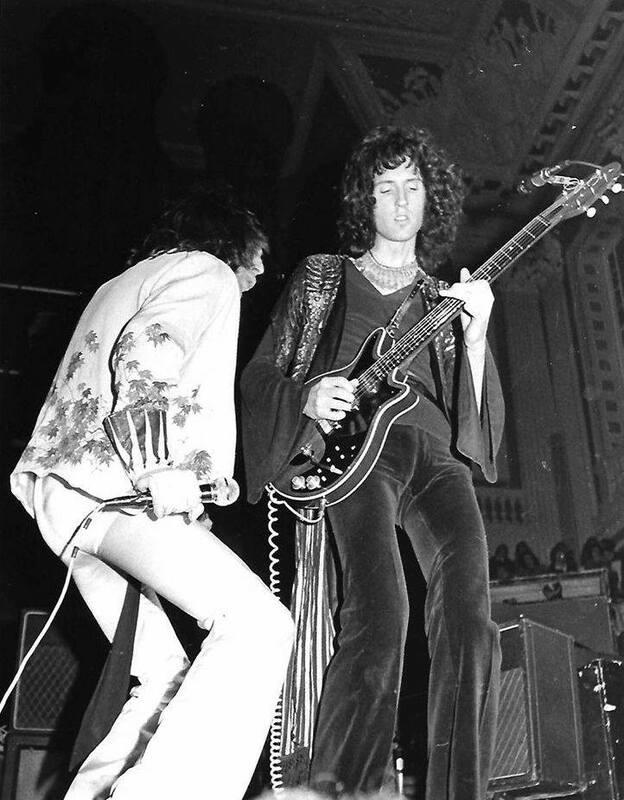 This impressed some audience members, but not everyone. During the last song, Freddie was hit in the face by a hot dog. With ketchup falling down to his neck, he was visibly distraught." 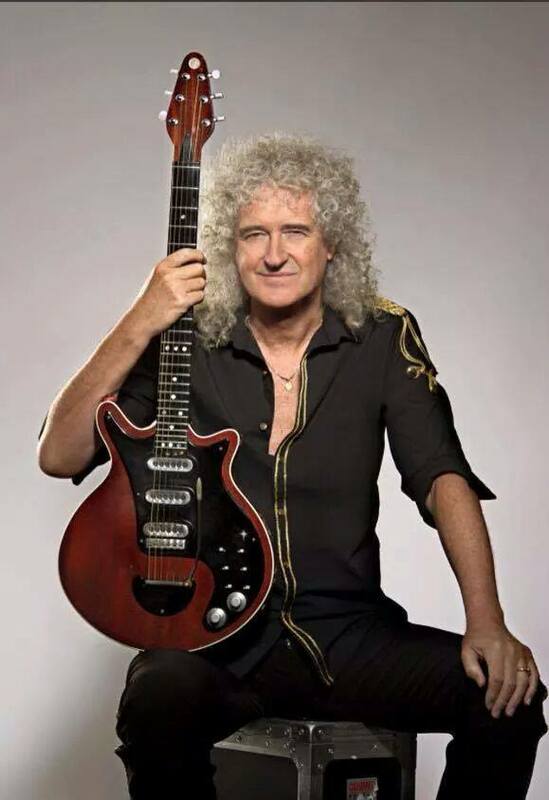 The fourth pic is particularly interesting, as it is the last known shot of the fuzz switch still visible on Brian May's Red Special. 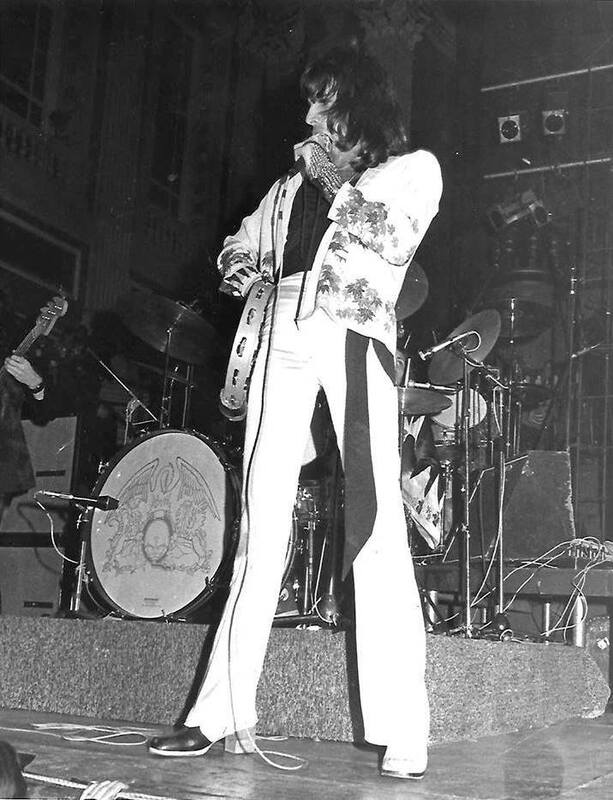 It would soon be covered with duct tape and then removed and replaced with a red dot (and later black tape again). 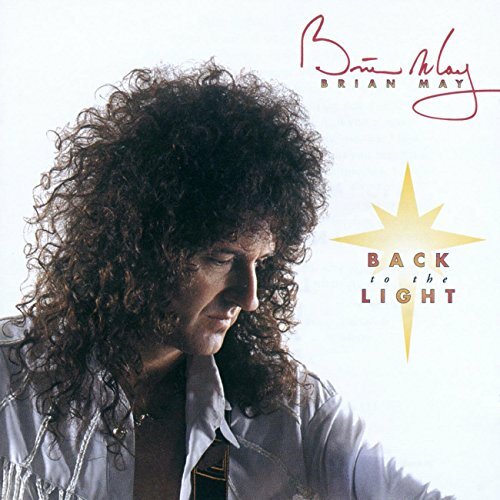 In 1998 it was finally replaced with the "May Star" as seen on the front cover of his 1993 solo album Back To The Light. 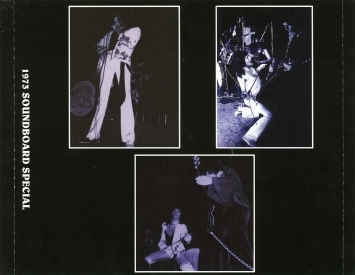 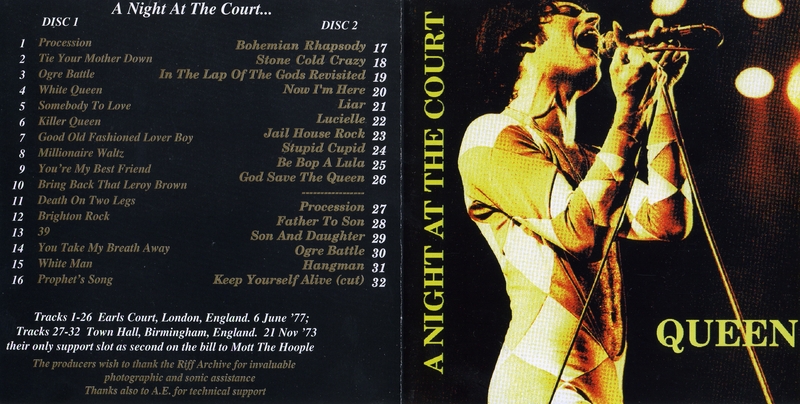 This 1994 bootleg was the first release of the incomplete Birmingham audience recording. 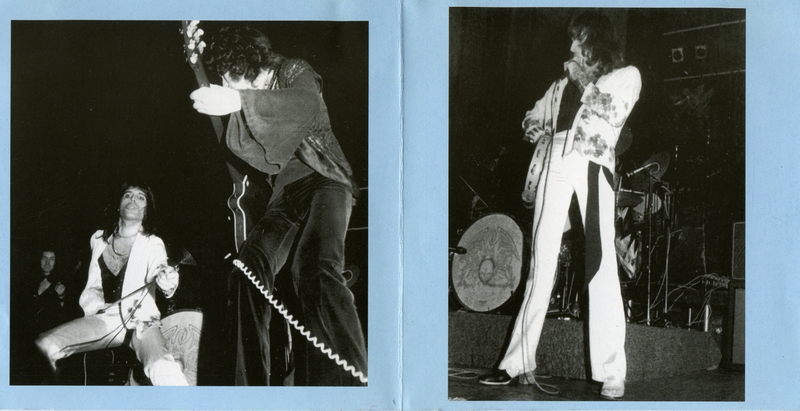 There's some distortion, probably from a bad tape transfer. 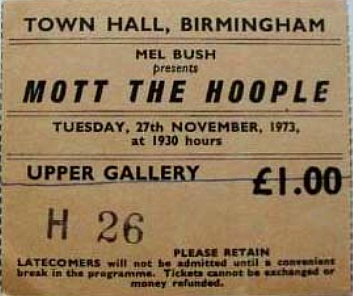 The given date of November 21 is incorrect. 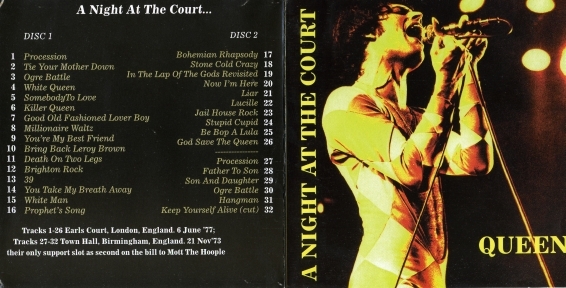 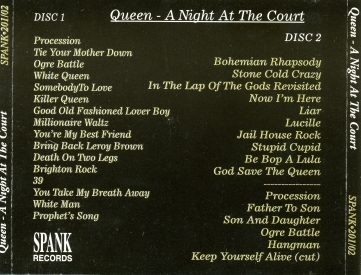 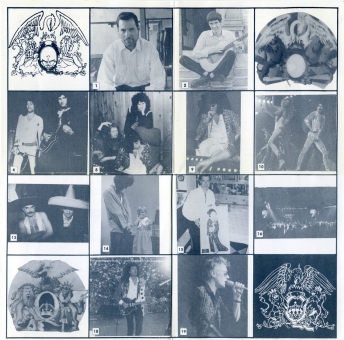 The bulk of the discs is a recording from an Earls Court '77 video feed. 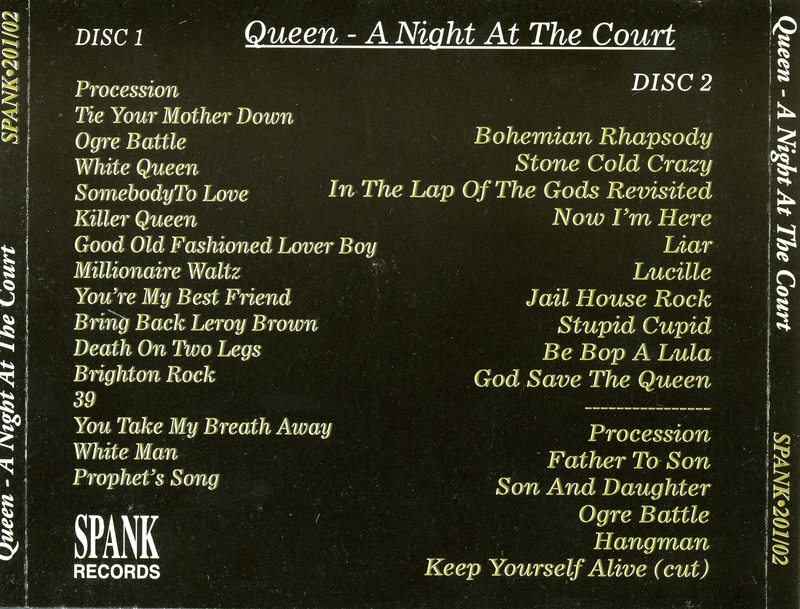 This 1995 Mexican compilation bootleg contains one song from the Birmingham audience recording, sounding exactly the same as on A Night At The Court. Gypsy Eye's version is a slight upgrade, as it doesn't have the distortion - although the bootleg label added a crackling effect in their mastering process (most likely hiss reduction), something which they very often would often do to their source material before pressing it to CD. That said, overall this is still a more pleasurable listen than the older version. 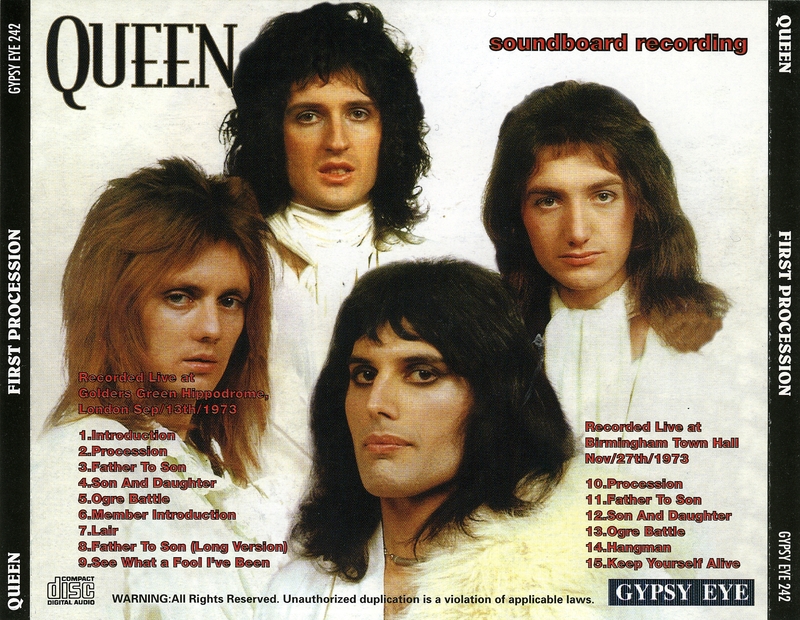 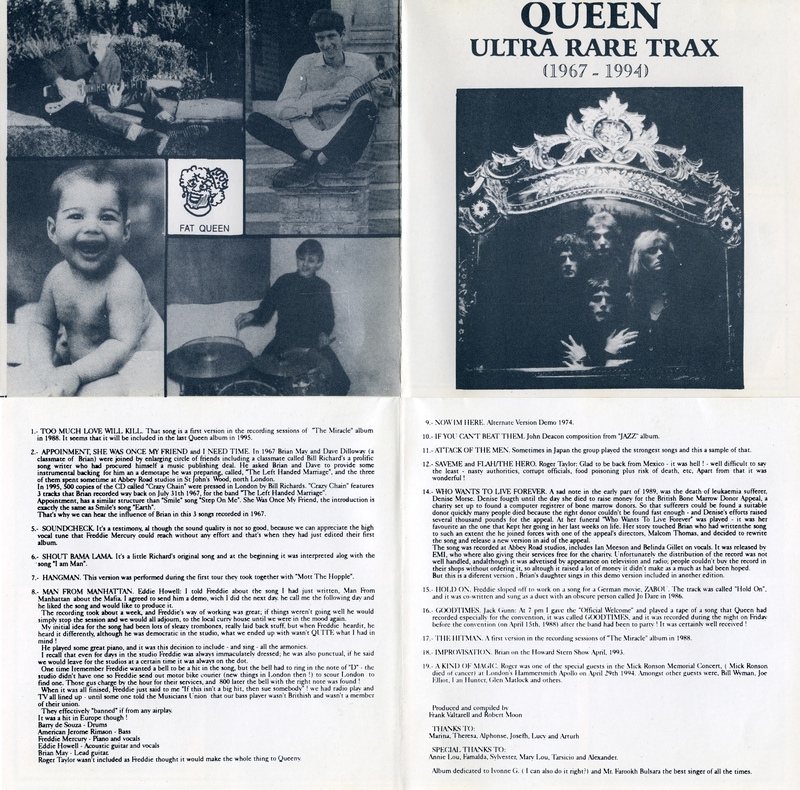 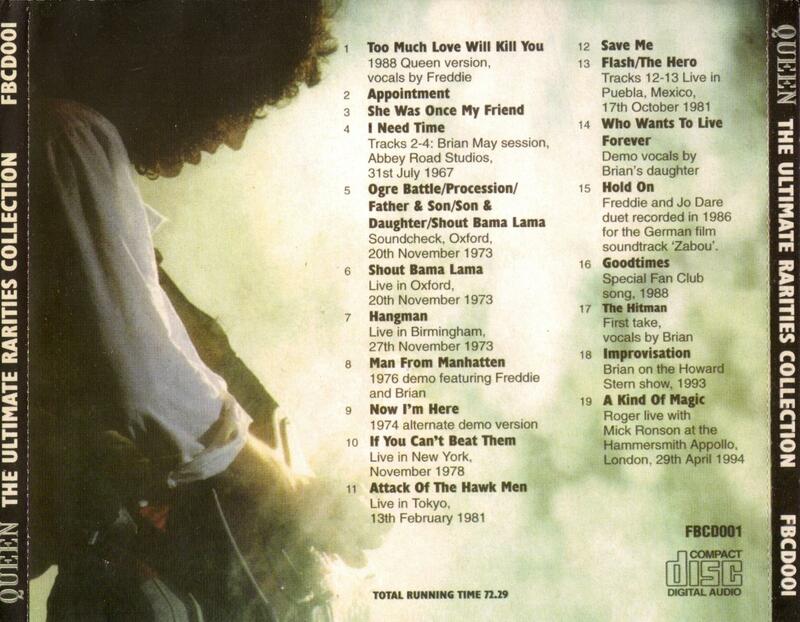 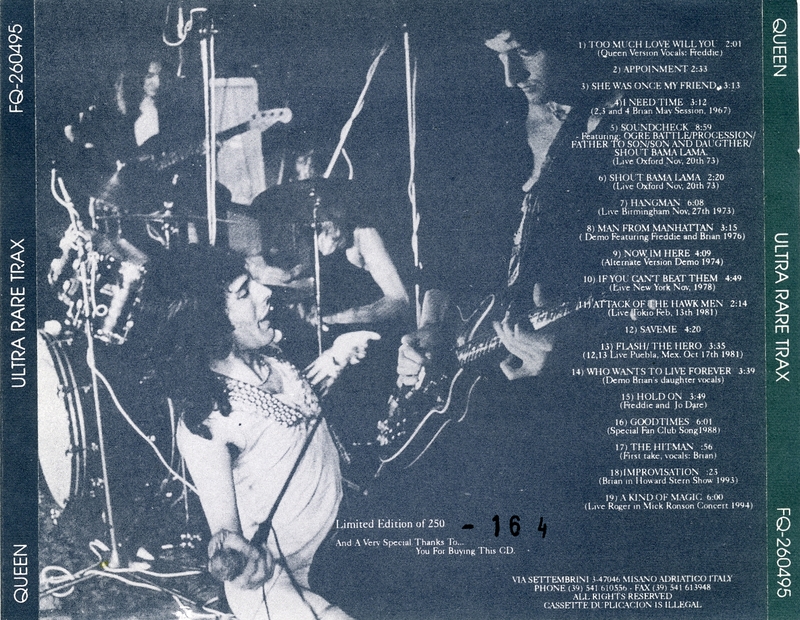 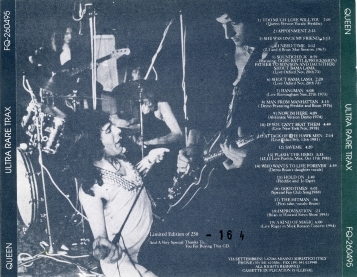 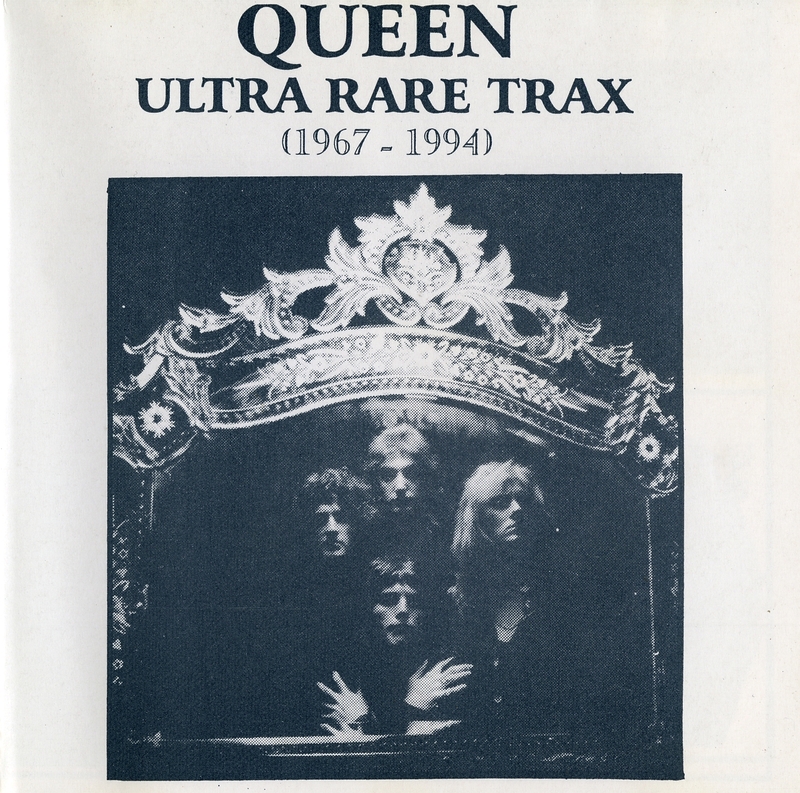 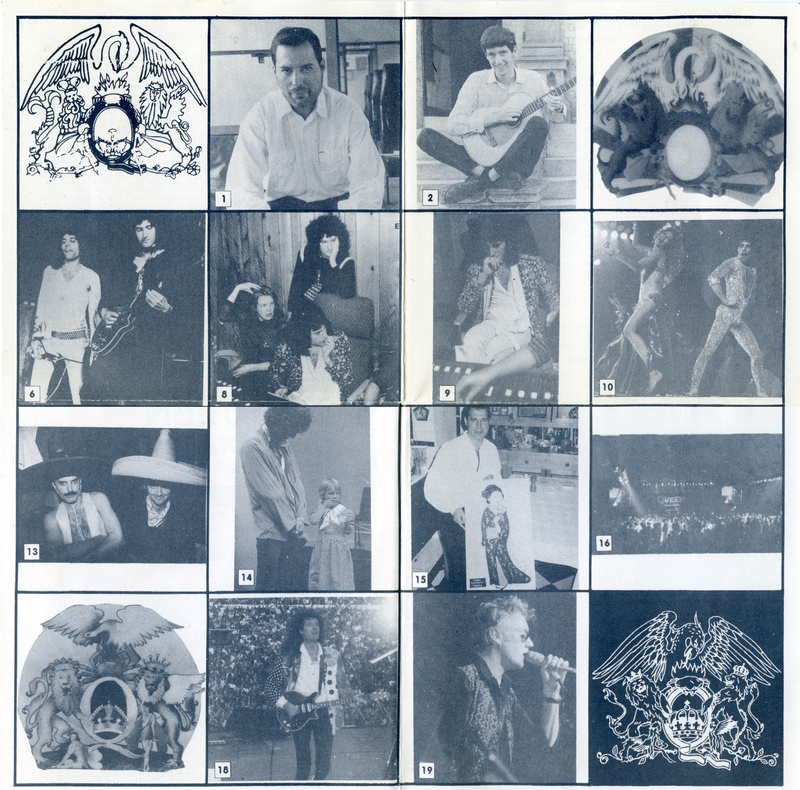 Keep Yourself Alive is still cut, although it's about a minute longer on this copy. 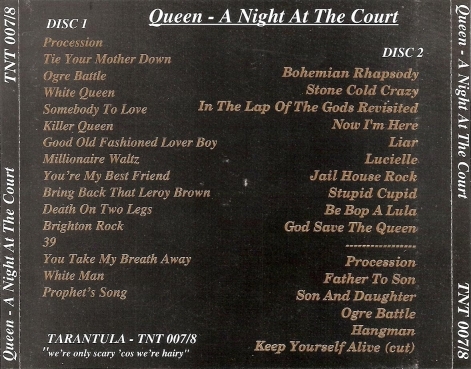 The Golders Green material at the beginning of the disc is inferior to other versions.